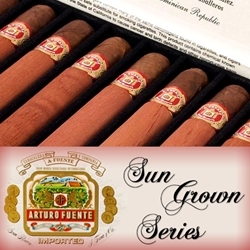 Representing four generations of family tradition, the Arturo Fuente Sun Grown Series are hand-rolled premium cigars produced at the world renowned Arturo Fuente tobacco plantation owned and operated by the Chateau Fuente family of handmade cigar makers. These premium cigars are a combination of binders and fillers from the popular Gran Reserva's and rolled up to perfection with dark Ecuadorian-grown sun-grown wrapper leafs. Each time you light up an Arturo Fuente Sun Grown cigar, you will experience a medium-full bodied smoke with delicious cedar, cinnamon and leather tones accented by a lasting sweetness. Stock up your humidors with these masterpiece premium hand-rolled cigars by Arturo Fuente. They also make a great gift for a family, friend or loved one. The Arturo Fuente Sun Grown Series are hand rolled premium cigars that make an excellent choice for any cigar connoisseur. Smokers Discounts has made it easy and affordable to buy premium cigars online. A variety of sizes and flavors are listed below at our discount online cigar store. Each of these styles are in stock and available. Call us for more details!